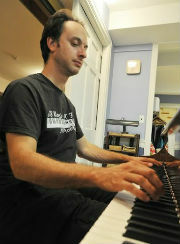 North Dakota native David Tiedman is an active educator, pianist, music director and composer. After completing his Bachelor’s degree in music education at Dickinson State College (North Dakota), he earned two Master’s degrees, one in organ and harpsichord performance from Southern Methodist University in Dallas and one in choral conducting from the prestigious New England Conservatory in Boston. Since then, he has served as musical director and played piano for shows throughout New England including such The Wiz, Company, Joseph and His Amazing Technicolor Dreamcoat, Fiddler on the Roof, A Grand Night for Singing, Baby, Once Upon a Mattress, Wonderful Town, She Loves Me, Damn Yankees, Oliver!, Little Shop of Horrors and You’re a Good Man, Charlie Brown. 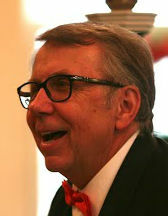 He has also served as Accompanist for the Treble Chorus of New England and Boston Cecelia. In March 2014, he won the David Davidson Composition Contest with his original work, Cascades, for advanced handbells, flute and optional handchimes and triangle/finger cymbals. It was premiered at the Distinctly Bronze East Festival in October 2014. In addition to his work with HGC, he serves as music director for Pilgrim Church in Sherborn and maintains a private studio of piano and organ students. Maxim Lubarsky is originally from Odessa, Ukraine. He holds a Bachelor of Professional Music from the Berklee College of Music as well as a Master’s Degree in Performance from Odessa State Conservatory in the Ukraine among other academic achievements. Maxim has toured extensively as an arranger and accompanist and is a private piano instructor. He loves American jazz music, and can be heard playing throughout metro Boston. Sign up for his e-mail newsletter and find out where you can hear him at http://www.maximlubarsky.com.